HOUSTON — Over 140 people gathered in Houston on Feb. 19 to honor the Texas recipients of the Congressional Gold Medal, which was awarded in 2011 to the 100th Infantry Battalion, 442nd Regimental Combat Team, and Military Intelligence Service. In attendance were veterans George K. Fujimoto, Tommie Okabayashi, Kenneth N. Takehara, and Willie Tanamachi of the 442nd RCT and George I. Nakamura of the MIS. 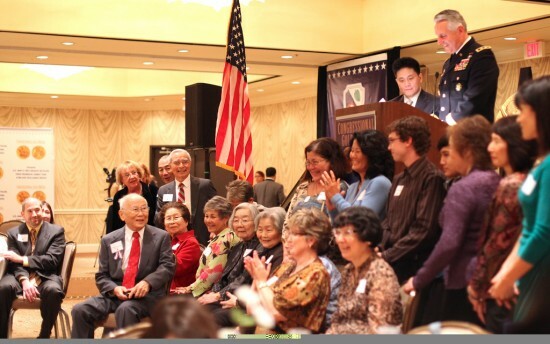 The dinner ceremony was sponsored by the Japanese American Citizens League’s Houston Chapter, especially to honor those veterans and family members who were unable to attend the larger gathering in Washington, D.C. last November. The five veterans in attendance were presented with bronze replicas of the Congressional Gold Medal. 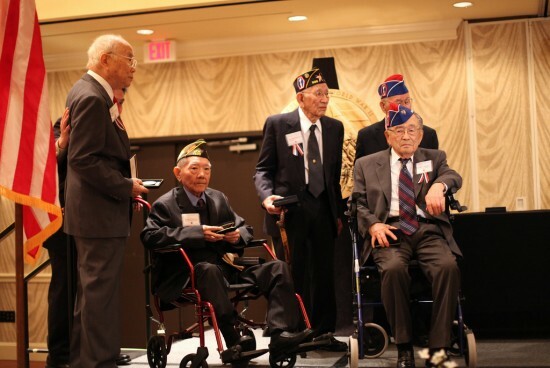 Family members, friends, dignitaries, and veterans gathered at the InterContinental Houston and enjoyed the poignant ceremony that highlighted the accomplishments and brave service of Japanese American soldiers during World War II. In a tribute to the role the 442nd played in helping to liberate a subcamp of Dachau, a Nazi death camp in Germany, the colors were presented by the Jewish War Veterans of the USA, Houston-Levy Post 574, before local Japanese teacher Helen Nakamoto led the audience in the national anthem. Retired Col. Arthur Casiraghi, president of the National Association of 36th Division Veterans, was also on hand to offer an invocation in honor of his fellow former members of the 36th “Texas” Division, which was rescued by the 442nd after being trapped behind enemy lines in northern France. The evening was hosted by renowned Houston television news anchor Shara Fryer, who won a Lone Star Emmy Award in 2006 for her work on “Unlikely Liberators,” a documentary chronicling the service and internment of Japanese Americans during World War II. After welcoming remarks by JACL-Houston President Gary Nakamura, the program featured representatives with proclamations from Rep. Ted Poe (R-Texas) and Al Green (D-Texas). A proclamation was also received from Houston Mayor Annise Parker, who recognized Feb. 19, 2012, as Nisei Veterans Day. Also in attendance was Consul General of Japan Jota Yamamoto, who spoke in praise of the 100th/442nd and MIS. Historian and JACL-Houston Vice President Dr. Abbie Grubb followed with a special recognition of the Day of Remembrance and the Japanese American community’s unfortunate history of removal and confinement. Local business leader and JACL-Houston member Donna Fujimoto Cole introduced the keynote speaker for the evening, Dr. Robert Ivany, retired U.S. Army general and president of the University of St. Thomas. In addition to the presentation of CGM replicas to the five veterans, special recognition was given to the family members who represented deceased veterans, and the Texas Honor Roll was read. Veterans who currently reside in Texas but were unable to attend the ceremony included Shigeru Imai, Walter Mackey, and John Ogata of the 442nd. The printed program and ceremony also honored the 34 veterans from Texas who have passed away, many of whom had family members in attendance. The Texas Regional CGM Ceremony was made possible by the members and volunteers of the JACL Houston Chapter. Additional special thanks for the evening went to the National Veterans Network, Cole Chemical, the Gondo family, the Nakamura family, the Okabayashi family, Insight History Consulting, and Sibley Cooley.